Blowout Sale! Save 74% on the Deluxe Padded Toileting Patient Lift Sling, with Belt, Size (Extra Large), 450lb Weight Capacity by Patient Aid at Get Cheap Health Insurance. MPN: PA-122XL. Hurry! Limited time offer. Offer valid only while supplies last. The Patient Aid Padded Toileting Lift Sling was designed to provide easy access for toileting, adjustment of clothing and personal hygiene cleaning. 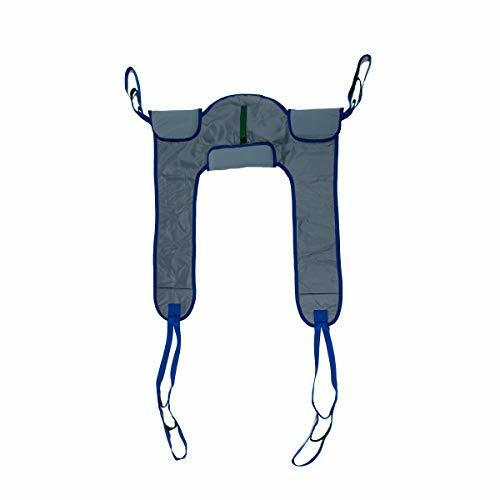 The Patient Aid Padded Toileting Lift Sling was designed to provide easy access for toileting, adjustment of clothing and personal hygiene cleaning. Toileting slings must only be used when transferring a resident from a seated position. This Lift Sling Fits Hoyer(R), Invacare(R), Drive(R), Medline(R), Lumex(R) and most other patient lift brands. The toileting sling is ideal for transfers from sitting on a bed to a chair, wheelchair, or toilet, or chair to chair. The toileting sling is to only be used with patients that have full head and neck control. The toileting sling is a safe, supportive, comfortable and easy to use sling. One of the highlights of the toileting lift sling is the wide opening which allows the caregiver to remove the patients clothes conveniently and quickly. The toileting sling is made with a Solid Polyester fabric which supports the back and provides comfort for under the thighs. The extra padding under the arms and accross the lower back provide superb comfort for the patient. The padded fabric also protects those patients with sensitive skin while also preventing the patient from sliding. The toileting sling has four reinforced attachment points to allow the sling to work with all competitive floor style patient lifts and their 2,4 or 6-point spreader bars. The 450lb weight capacity allows the toileting lift sling to accommodate a wide variety of different size patients and their specific needs such as toileting access, cloth removal and personal hygiene cleaning. Size Extra Large. Recommended patient weight range of 310-450lbs. 1 year warranty. Torso Belt Adjusts from 33" - 59". Refer to Size Chart in Pictures.